It seems as if at some point, every kid falls off their bike. Occasionally, adults fall too. Most of the time, the injuries are manageable; cuts, scrapes, bruises, and possibly a few bruised egos. But with a little TLC and basic first aid, most are back up on their bikes in no time. But some injuries are more serious, and require more professional medical attention. They might be sprains or broken bones or they could be much more serious, like a head injury. When the head is injured, the result can be anything from a minor concussion to a traumatic brain injury that may affect a person’s cognitive abilities for the rest of their life. In many cases, suffering a head injury means death. 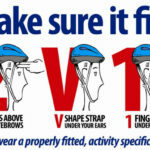 One way to greatly reduce the amount of head injuries, is to wear a properly fitting bike helmet on a consistent basis. The problem is, this usually doesn’t happen. How Much Can Helmets Help? Helmets are thought to reduce head injury risk in cyclists by nearly two-thirds, regardless of how old the cyclist is. However, bicycles are used more frequently by children than adults. This makes sense, since it is the only vehicle that they can legally drive. It is estimated that wearing a helmet could reduce childhood fatalities from bicycle accidents by 75%. If everyone between 4-15 always wore a helmet approximately 150 lives could be saved each year and there would be near 40,000 fewer head injuries. Using helmets can save money too. When kids 14 and under are hurt or killed in bicycle-traffic accidents the cost adds up to $2.2 billion each year. Spending a dollar on a bike helmet can save $30 in medical and other costs related to the injury. Several groups actively advocate for the use of bicycle helmets including the National Highway Traffic Safety Association, US Consumer Product Safety Commission, The Center for Disease Control, The Children’s Safety Network and more. Most individuals agree that bike helmets are a good idea too. West Virginia University conducted a survey published in 2004 that asked both 4th-5th grade kids and their parents about their thoughts concerning bike helmets and whether or not they were being used. In the survey, 97% of parents and 87% of kids indicated that helmets should be worn during bike rides. Seventy percent of parents appeared to believe that their kids were wearing their helmets on every ride, but just 51% of kids said they actual were wearing their helmets. One fifth of kids revealed that they never wore a helmet, while only 4% of parents admitted that their kids went out on their bikes without one. While factors such as comfort and peer opinion play a role in whether or not a child puts on a bike helmet (and keeps it on) their parent’s behavior seems to make a difference as well. Nearly 90% of the kids that said they did not wear helmets had parents who did not wear them either. Overall, fewer adults and older children wear helmets than younger children. In recent years, there has been a stronger push comply with the safety request. Therefore, the younger the child, the more likely it is that they have been raised with the expectation that they wear their helmet. Parents also have more control over the actions of younger children, and can refuse to buy a bike without a helmet. They can also ride with the child while wearing a helmet of their own. Whether the person riding is an adult or child, they are more likely to wear a helmet if the person riding with them is wearing one too. Those whose parents are more educated or make more money also wear bike helmets more often than their less affluent peers. Wearing a bike helmet is far from second nature to most adults, since most did not grow up with the habit. In 1991 only 18% used them, by 1998 the usage rate was up to 50%. The younger a child is when they start wearing a helmet, the more likely it is that they will be comfortable with it. Older kids may take off the helmet in order to rebel, or it might not be comfortable for them to wear the helmet. Some kids feel “geeky” wearing a helmet, others find that a helmet is physically awkward or hot. Helmet designers continually strive to make helmets that are easier to wear, regardless of the weather. In 2002, a survey conducted by the National Survey of Bicyclist and Pedestrian Attitudes and Behavior found that the majority of the participants, age 16 and up, supported bike helmet laws for both adults and children. More than 60% supported the laws for adults, and 90% supported laws for children. Actual laws governing helmet use is spotty, and aimed toward children almost exclusively. The District of Columbia and 21 states have some sort of bike helmet law. While Arizona does not have a statewide law regarding the use of helmet, the municipalities of Flagstaff, Pima County, Sierra Vista, Tucson, and Yuma all have bike helmet mandates for those under 18. Several other communities across the country also have similar laws in place in order to help protect children from bicycle accident injuries and fatalities. Over all, the mere existence of a law can make the difference between knowing the right thing to do, and actually doing it. States that have bike helmet laws are seeing fewer fatalities and injuries than states with no such law. One state has had a state bicycle helmet law for at least five years, and as as a result has seen bike related fatalities of those 13 and under decrease by more than half. Another study showed that one county that enforced the use of bicycle helmets saw 58% more kids 14 and under using their helmets than kids of the same age in a similar community, but no law. When a group of kids age 8-12 were questioned about how a law would affect them just under half reported that it would be something that would convince them to wear their helmet, while a little more than half indicated that they would wear a helmet if their parent required it. Whether new laws are passed or not, it is clear that the roads will continue to include cyclists with and without helmets. While riders with helmets are better protected than those without them, no one riding a bike is immune to injury. In addition to head trauma, bike riders also experience broken bones, neck injuries, and spinal cord injuries. While the riders own behavior may factor into the circumstances of their accident, frequently other people carry the majority of fault for an accident. Motor vehicle drivers fail to give cyclists the right of way when it is their turn. They don’t properly educate themselves on how to safely pass a cyclist, or they drive distracted or otherwise impaired resulting in a collision with a bike. Even dogs running into the road can cause bicycle accidents that result in serious injuries. While a cyclist who has been injured in an accident may wonder what they might have done differently in order to prevent it from happening or reduce the risk of injury, it is also important to look at the legal responsibilities of others involved. This is true whether they have been injured themselves, or if a loved one, including a child, has been injured or killed. In many cases, a free consultation with a bicycle accident attorney can help them assess their case and get a good look at the possible road ahead.